Today’s guest is not just sharing one favorite tool but three. Can you “Spy” them while watching her video on how to use a twin needle? Hello, I’m Deby. I write a sewing blog at So Sew Easy. I’m fairly new to sewing so I am delighted to be able to share some of what I have learned as part of this series. I live on an island where I can’t buy any sewing patterns, so I started off downloading free patterns from the internet, and reviewing them on my site, and now I even offer free sewing patterns I have designed myself. This September marks not only National Sewing Month, but my one year sewing anniversary. 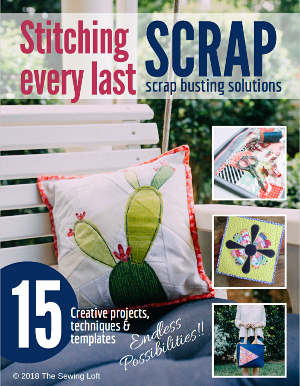 I started sewing just one year ago and thanks to all of the wonderful resources and blogs online, like here at the Sewing Loft, I’ve learned such a lot in my first year. One of the areas where I struggled a lot was in sewing a hem on many of my knit fabric projects. My cowl neck dress just kept getting shorter and shorter as I cut off more botched attempts, until eventually I left the hem unfinished! But eventually I was able to master the use of the twin or double needle and now I hem my knit fabrics with confidence. The twin needle can be used for a neat finish to hems, cuffs, necklines and sleeves on your stretch projects, but did you know that you can also get really pretty results using it with decorative stitches and different colored thread? Take a look at the video I made showing you how to use, thread and enjoy sewing with the twin needle. 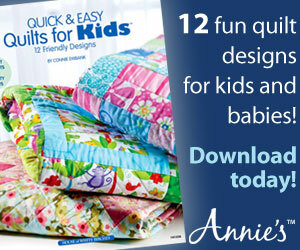 If you love to sew with knits and create fun things for yourself, Deb’s site is one to visit! She has a ton of free tutorials on skirts, shirts and dresses on her site. It’s a bookmarker for sure! Sarah is here tomorrow from Blue Susan Makes sharing what I think is one of the most needed bursts of color in the workroom. I can not wait to make a few for myself. 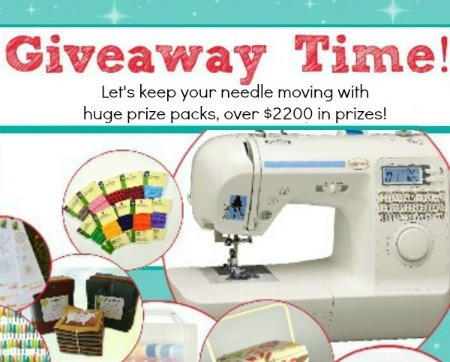 ps- did you enter the National Sewing Month 2013 giveaway yet? Check out the amazing prize packages and enter to win here. I had never seen that type of needle threader until last night when I looked through the accessory box on the sewing machine that my father in law gave me last month since he can no longer use it. There were 3 of them in there although one is quite bent & I don’t think they had the little hook or at least I didn’t see it, I’ll have to go check it out now. I did use them last night when I used his machine because I’m used to the automatic threader on my machine. I have never tried to use the double needle but I also haven’t really sewn with knits although I’ve recently bought a bunch with some grand plans they just haven’t come into the rotation yet. Hello, Heather, I use the needle threader all the time, Like Deby my eyesight is shorting out, so the needle threader is a handy tool, not just for threading but it also can hold your single needle for ease of inserting into sewing machine. Love Deby’s use if the tape, I sew on knits and I have used single bias tape not an iron on fabric, will have to get some and try it out. 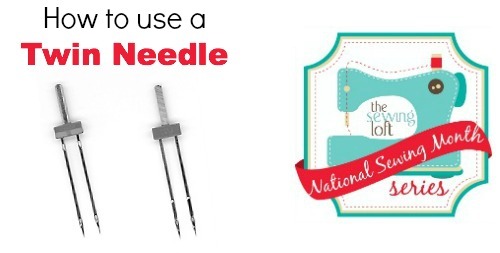 I have never used the needle threader Lori but am very interested in it. I might need to pick one up to try out. I do too Anne! I spied a few photos of you at Sewing Summit this weekend. Will you be at market next month? If so, I would love to connect. Thank you for the feature Anne. The tape I am using in the video is called Fusible Knit Stay Tape and I got it online from Londa’s. Only one side is fusible and it is stretchy although not as stretchy as the knit fabric might be. Hemlines don’t usually have to stretch too much. I’m not sure where you might get this in the UK, but you could try to contact the manufacturer. It was great to have you Deby! I am so glad you could be part of the series. Nice video. You’ve given me the courage to try using the twin needle! Thanks for the link to the needle threader as well. I have never used a double needle before out of pure feight. But your tutorial is excellent and encouraging. I’m going to play around with it and incorporate some decorative stitching on my aprons. Thank you for posting this. This was very helpful! Thank you very much for taking the time to provide this information. I will be looking for the fusible tape now that I’ve seen how useful it is in hemming knits. I tried the double needle and wasted an awful lot of time trying to get my machine set up for it. I had to insert a wooden skewer that I cut to size in the hole on my Singer for the spindle to hold my second spool of thread. I had to wrap duck tape to the end of the skewer so it would fit the hole. It took me an even longer time to figure out that I had to increase the tension to about 9 before I could get rid of the mess of looping thread on the underside. Finally I got my double row of nice stitching and completed my project. I am definitely going to buy some of that fusible tape next time I’m at the fabric store. My material edge wanted to curl quite tightly, and of course you can’t see it when you’re stitching the top, so the fusible tape will make a nice neat and professional job next time. Thanks again!